Sammey Bunch hits a home run in a 2015 Class 2 softball semifinal. Photo by Brandon Foster. SPRINGFIELD, Mo. — The Fatima softball team was having a difficult time moving runners past third base Friday in its Class 2 semifinal against Iberia. So the Lady Comets decided the easiest route to home plate was over the fence. 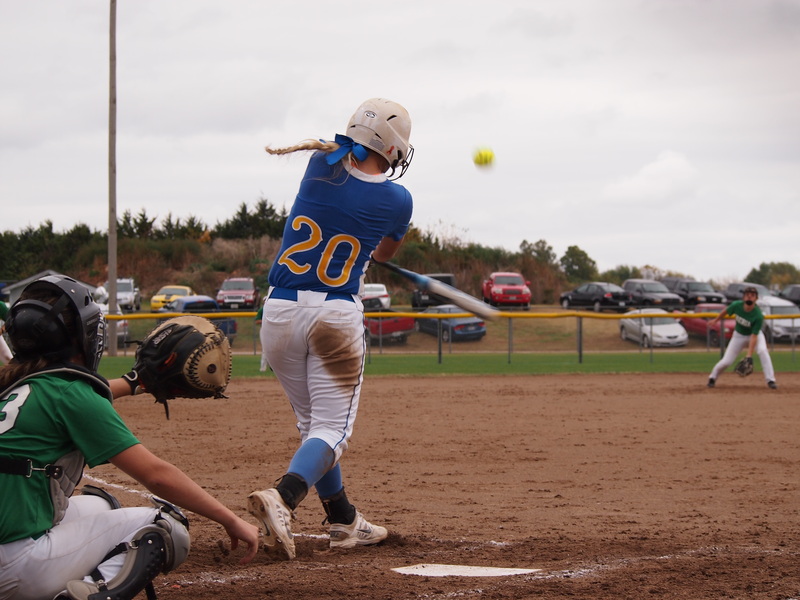 Seniors Hailey Buscher and Sammey Bunch homered to account for all of Fatima’s runs in a 3-1, eight-inning win that sent the Lady Comets to the state championship game for the second straight year. Fatima (22-9) faces Lathrop (26-3) with a championship on the line at 2 p.m. today at the Killian Softball Complex. Macy Berhorst got the win, allowing just three hits and striking out nine while walking none. Buscher, Fatima’s eight-spot batter, hit a two-run homer in the eighth inning to provide the deciding runs. Makayla Buscher, who singled ahead of her, also scored. Bunch’s home run gave her three straight playoff games with a solo shot, all of which began Fatima’s scoring. The Lady Comets stranded 11 runners, six in scoring position, and Hailey Buscher’s home run was Fatima’s first hit of the game with runners in scoring position. The Lady Comets had a runner on third with one out in each of the first three innings. Morgan Berhorst doubled to left field in the fourth but was also stranded. Fatima left a runner on base in every inning. Iberia took the lead in the fourth when Cailin Edwards was struck in the helmet by a pitch to become the Lady Rangers’ first baserunner of the game. She stole second and scored on a double to left by Faith Duncan. Berhorst was able to get out of the inning without allowing any more runs, however. Scheppers came out to the circle, and the following batter hit into a fielder’s choice that led to Duncan being tagged out in a run-down. Berhorst then needed just five more pitches to get out of the inning. Bunch’s solo homer in the fifth came in her only at-bat in which she wasn’t walked. The “unintentional intentional” walks she received later in the game drew boos from the Fatima faithful. “I was excited when I didn’t get walked and could actually hit the ball,” Bunch said. Her home run went over the left-field fence, as did her bombs against Blair Oaks in sectionals and Centralia in quarterfinals. Edwards and Duncan hit back-to-back singles to threaten in the sixth, but Berhorst got a strikeout and a groundout to escape. The Lady Rangers walked Bunch to start the next inning, and it paid off, as the next pitch resulted in a double play. But Berhorst killed any Iberia momentum by striking out Reagan Stiebel to start the bottom of the sixth after Stiebel fouled off six two-strike pitches. It was the third straight playoff game in which Berhorst allowed one or fewer runs. Buscher’s home run in the eighth was Fatima’s first hit since the fifth. The long drive was one of the more memorable moments of her softball career, she said. “It’s pretty high up there,” she said with a laugh. Like Bunch, she sent the pitch deep to left. Fatima won last year’s championship game 16-3 against Pleasant Hope. Today’s opponent, Lathrop, beat Portageville 1-0 on Friday. Portageville won the Class 2 third-place game with a 10-0 victory over Iberia in six innings on Friday night. This entry was posted in Fatima High School, Fatima Softball, Jefferson City News Tribune, Jefferson City News Tribune Sports, Uncategorized and tagged game stories. Bookmark the permalink.